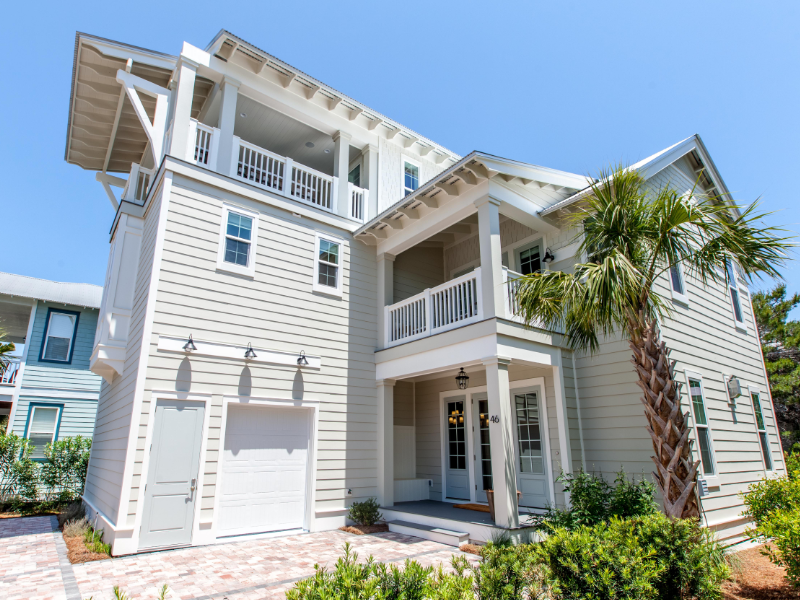 Rossana’s Beach House is a newly constructed home in popular Seacrest Beach, snuggled in between Aly’s Beach and Rosemary Beach. Surrounded by endless dining, shopping and entertainment, your family can always find something to do. Opt for walking 5 minutes to the beach or hop on the complimentary shuttle service (runs seasonally). You are steps away from the 12,000 square foot lagoon pool. When you arrive at the home you will have parking for five cars and easy access to the property. Upon entering this new and exquisite five bedroom, five and a half bathroom retreat, you enter the open concept kitchen, living and dining room with a touch of coastal elegance that was expertly designed with gray stained oak floors, imported tile flooring, white marble and granite counters, and Kitchen Aid appliances. The living room has plenty of plush seating for the entire family. You will find the first king guest bedroom just beyond the kitchen featuring a private bath. As you enter the second floor, straight ahead you will enter the “shiplap” master bedroom with king bed and private bath with walk in shower and soaking tub. You also have a private balcony off the master. Across from the master bedroom you will find the fun bunk room with four built in bunks and a shared bathroom. On the other side of the bathroom you will find the third king guest bedroom with shared bath. On the North East corner of the home on the second floor you will find the fifth king guest bedroom with private bath. On the third floor you will be entering the homes playground so to speak. Enjoy game nights in the game room with ping pong table and dart board or walk into the home theatre room to watch a movie or big game on an eighty inch television with surround sound and theatre seating. The third floor deck features a covered patio with a grill station and sunset viewing area.